Affirmative Repositioning leader Job Amupanda addressing a crowd as they prepare to march to the Windhoek Municipality to deliver a memorandum of demands on land delivery and housing. The Affirmative Repositioning movement has called on parliament to enact a law prohibiting foreign nationals from owning land in Namibia. The proposal was submitted to parliament in Windhoek yesterday by over 300 activists who took part in a peaceful demonstration on land and housing matters in the country. Affirmative Repositioning (AR)'s proposal was received by speaker of the National Assembly, Peter Katjavivi. Their proposal seeks to regulate foreigners' right to acquire property in Namibia, and would "reaffirm and give power, control and ownership of the land in Namibia to the people of Namibia". Banning the sale of land and ownership of farmland by foreigners was among a number of topical issues discussed at the second national land conference in October last year. The conference adopted a position to direct the government to expropriate underutilised farmland and those farms owned by absentee landlords - mainly foreigners - with just compensation, as guided by the Constitution. This issue was, however, not resolved at the conference after participants failed to reach an agreement, citing legal implications. AR activist Stanely Kavetu, who delivered the proposal to Katjavivi, said parliament has the power to "prohibit or regulate as it deems expedient the right to acquire property by persons who are not Namibian citizens", as provided for in the Namibian Constitution. He added that the proposal prohibits the utilisation of communal land by foreigners for any purpose. "Any allocation of communal land to a foreign national before this act shall be deemed to have been an illegal transaction, and shall be repudiated," the proposal states. Under the proposal, foreigners can only utilise land in the country if they were in partnership with Namibians, in which Namibian citizens must not have less than 51% ownership. Foreigners would also be allowed to lease land in Namibia for economic development, but such lease agreements would not exceed a period of 10 years, the AR proposed. During yesterday's march, AR also gave the Windhoek municipality a six-months ultimatum to allocate over 200 unoccupied houses built in 2015 under the government's mass housing programme in Otjomuise Ext 11. AR activist Job Amupanda said during the march that if the municipality fails to allocate the Otjomuise houses within the specified period, AR "will allocate these houses ourselves". The movement also wants the municipality to finalise the servicing of over 300 plots at Goreangab which started in 2016, and likewise demanded a response to over 14 000 land applications submitted in 2014 through a mass land application. Amupanda said although the municipality has issued acknowledgement letters, "90% of the applicants still await a positive response from the city". "We demand that the city responds positively to the 14 000 applicants by pursuing a process of pre-allocation of land... failure to respond will result in mass land occupation that will not be stopped by the state," he said. AR furthermore wants the municipality to build low-cost houses in affluent suburbs of the city such as Kleine Kuppe, Klein Windhoek, Ludwigsdorp, Avis, Eros and Auasblick to control the prices of houses. City of Windhoek chief executive officer Robert Kahimise, who received the AR petition, said the municipality has already through its transformational strategies planned since last year to explore the delivery of social housing. He added that the municipality last year also allocated unspecified hectares of land to the higher education ministry to build student villages. "That matter is out of our hands. 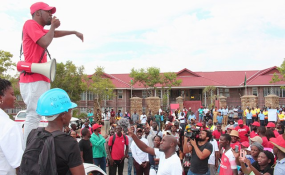 The purpose was to make sure that students do not squatter in informal settlements, or pay exorbitant amounts at privately owned properties," he said. Kahimise noted that the issue of the 200 unoccupied houses in Otjomuise and the servicing of 300 plots at Goreangab was the responsibility of the urban and rural development ministry.